Rio gold medallist Claressa Shields will become the first woman to headline a premium cable card. WHILE MANY PEOPLE have recently suggested that Ireland’s Katie Taylor can take women’s professional boxing to the next level, she is by no means the only star involved in the sport. 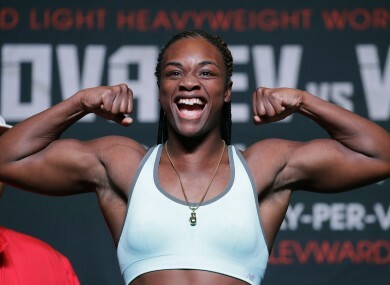 Like Taylor, US boxer Claressa Shields similarly decided to turn pro after Rio. The double Olympic gold medallist, who was also trained by Taylor’s former coach Billy Walsh in the lead up to the 2016 Games, is set for a historic night. It’s been confirmed that Shields will be involved in the first women’s boxing match to achieve main-event status on premium TV (i.e. channels such as Showtime, which require viewers to pay an additional fee on top of what is already being paid for cable) in the US. Shields — who had a famously fiery but ultimately successful working relationship with Walsh — faces Hungary’s Szilvia Szabados at Detroit’s MGM Grand on 10 March. It is quite an achievement for the 21-year-old from Flint, Michigan, in what is only her second fight as a pro. In addition, just under a month after Shields’ landmark evening, Taylor is set for the third fight of her pro career on the David Haye-Tony Bellew undercard on 4 March. Email “Katie Taylor beaten to the punch as top US Olympic star handed historic opportunity”. Feedback on “Katie Taylor beaten to the punch as top US Olympic star handed historic opportunity”.